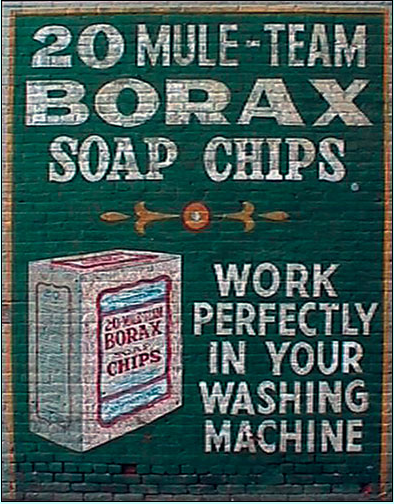 The Lindsay Mural Society has attended many Mural Symposiums. Carolyn Callison, the Lindsay Chamber of Commerce director in 2001, attended one of the first symposiums. It was held in 29 Palms, CA. She came back all excited about Lindsay hosting the 2003 symposium. And we did! It was a great success because of a lot of work on the part of our former Lindsay City Manager and Mural Society Vice President Bill and Carolyn Drennen. Our Mural Society continued to attend the 2005 symposium in Bishop, CA and in 2007 we went to Manteca. At each of these invigorating events, we met some great muralists. John Pugh, Colleen Mitchell Veyna, Art Mortimer, Wei Luan to name a few… We are fortunate to have murals by all of these artists. Currently, we are in a maintenance mode. We continue to monitor and repair our murals as needed. Our future plans include several new murals, including one that will pay tribute to the Lindsay Ripe Olive Company that was in Lindsay until 1990. Many people that had family or worked in the olive industry will be great supporters of this next mural. We will need to raise money for this, and we have some support coming in 2018 from the Lindsay Cultural Arts Society. We plan to place this new mural on the east side of the new Lindsay Library on Mirage. 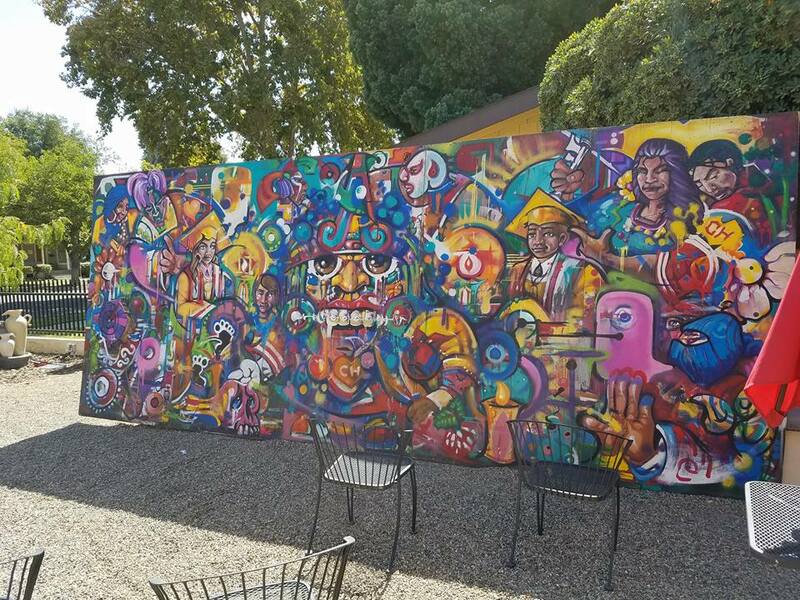 Another mural planned would be a replacement mural for Decades of Quality Citrus that was lost in a packing house fire in 2016. It honored an old Lindsay citrus family. In addition, our Lindsay Mural Society brochure will need updating. Changes happen over time, and with a new mural we want to include it. We are compiling a current list of artists, muralists, carpenters, painters, gardeners, and people interested in being part of our vision of bringing Murals and Public Art into our lovely Lindsay. • To help preserve and promote the cultural, ethnic and historical roots of Lindsay, in a manner that citizens and children will have some sense of who they are and where they came from and a sense of community. • To build pride in our community and to use public art as a tool to build bridges across barriers between ethnic and cultural groups. • To help beautify and revitalize historical Lindsay downtown by establishing public art and promoting tourism. Perhaps one of the first indications of a Mural Committee in Lindsay was dramatically portrayed by the dynamic improvement in the Community Theater facade, which features Lindsay’s first mural. This mural, again, marked the Lindsay Community Theater as a landmark in our community. That dynamic improvement is what the Mural Committee wanted to achieve; and what the Mural Committee continues to work toward with future murals. The subsequent murals continue to add interest to walls around our lovely town. But wait, let’s look back at what it took to get that first mural project launched. To quote former Mayor Saucedo, “Our mural project did not just happen overnight...;” it began at the Chamber of Commerce. 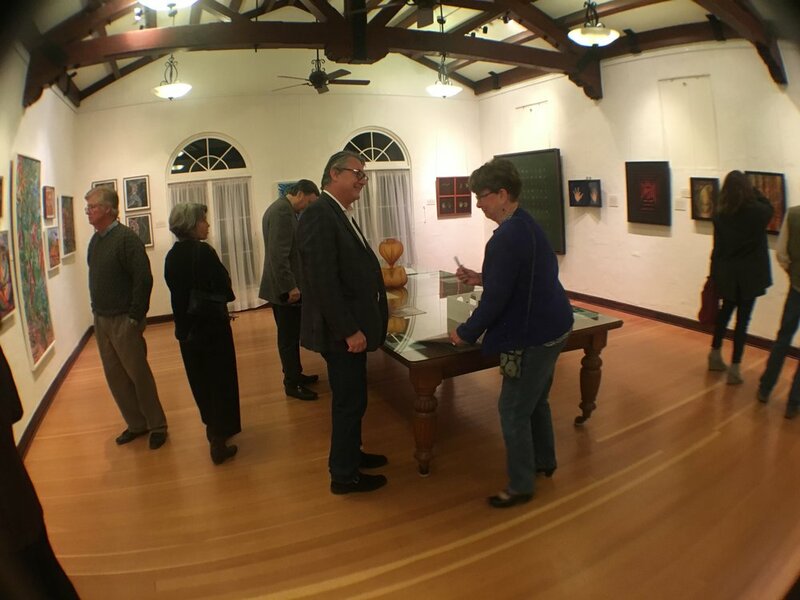 At the time, a request was made in the community for artists to talk to the director of the Chamber of Commerce and following those planning meetings, to submit renderings depicting aspects of those discussions. Several renderings were submitted by various artists and the Discovery painting by Josie Figueroa was selected for the theater’s north wall. All looked good. Then, the unthinkable happened. The 1990 winter brought the worst freeze in California history. The citrus industry, packing houses, pickers, and associated businesses were literally brought to a grinding halt. In 1991 General Cable, Lindsay’s second largest business closed due to the corporation’s decision to move the firm East. Closely on the heels on their closure, Lindsay Olive Growers, Lindsay’s largest business, declared bankruptcy and more residents lost their jobs. There was no extra money in the town to hardly keep the streets clean let alone pay for a mural. That is the legacy of Lindsay’s murals. 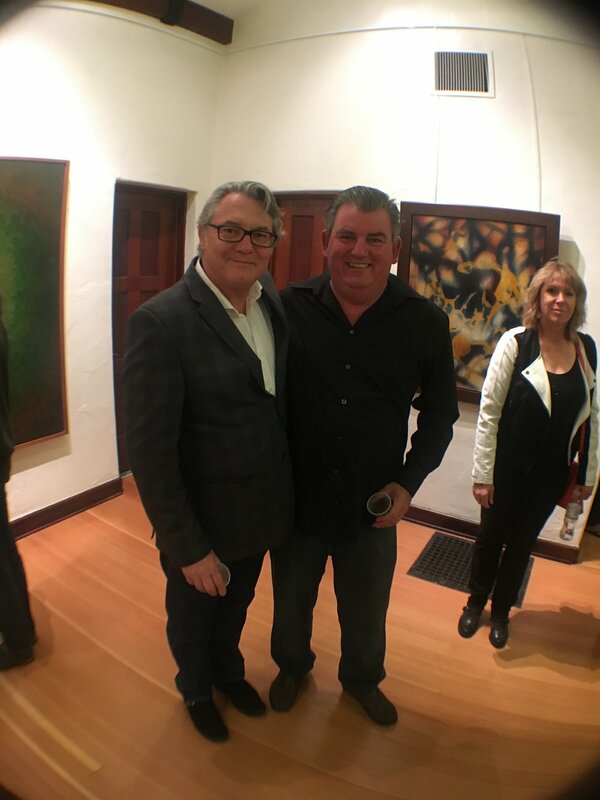 Well, as our former eloquent Mayor Valeriano Saucedo stated in one of his Lindsay Gazette Opinion columns, “The real word on the street is that the Community Theater and the mural are a source of pride and beauty.” And, it’s bringing pride and beauty to the community that is the mission of the Lindsay Mural Committee. The Committee meets monthly to discuss downtown renovation locations and projects. They also discuss concepts and artists. Current discussions center around funding. Funding is always an issue when fine art is involved. Ah, someday, we’ll say fine art and Lindsay in the same sentence and folks here won’t even blink an eye. Renovation of the downtown as a service and retail center was one of the Mayor’s Economic Development Task Force goals. Everyone knows pretty pictures don’t make a vital downtown full of commerce and activity. However, it is the icing on the cake that is evolving as Lindsay progresses toward its future business and job expansions. 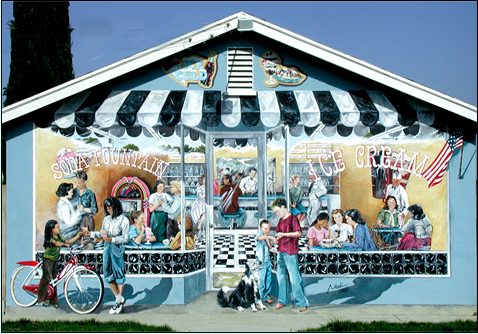 In the spring of 2006 the Mural Committee decided its name needed to encompass a larger segment of the vision of Lindsay to come. So now we are the Lindsay Mural & Public Art Society. 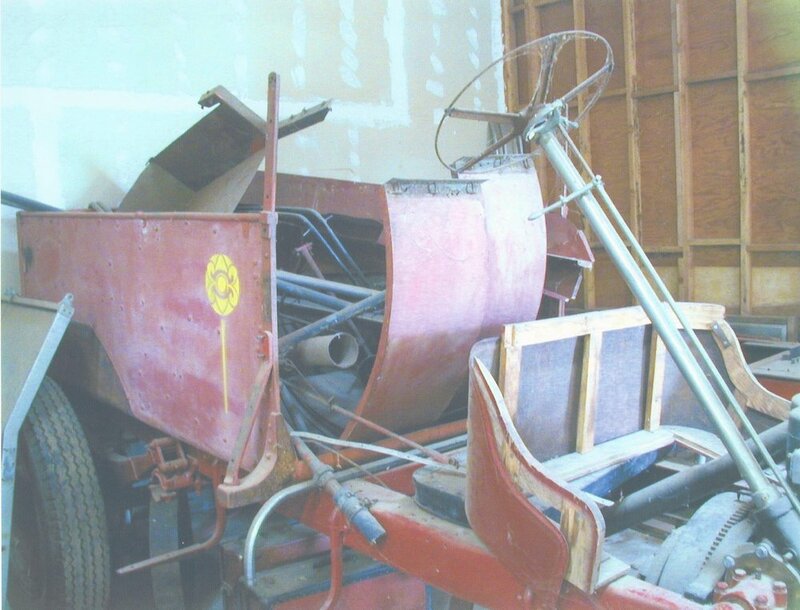 In 2001 the question was asked, “Whatever happened to Lindsay’s 1914 American La France fire engine that was part of the 1915 Panama-Pacific Exposition in San Francisco, California, commemorating the opening of the Panama Canal?” A small group of people came together to find the answer to that question. 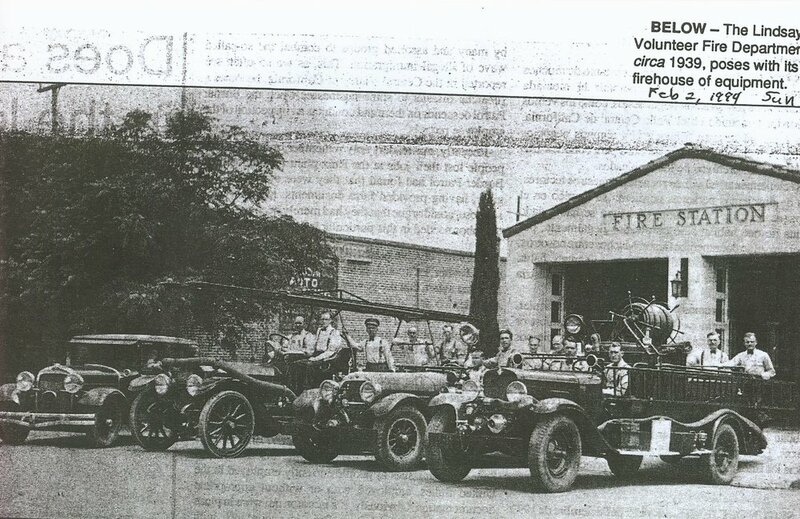 After a search of the Lindsay city records we discovered that it went to the Fresno firefighters’ union hall where it was taken apart for restoration and never finished. A collector in Auburn had purchased it from Fresno and after getting his name we found he had been killed in a work-related accident. His widow informed us that she had two fire engines from the Pan-Pacific Expo, and that someone in Colorado wanted to buy them and convert them to road racers. She liked the idea that we were going to restore the fire engine and decided to sell to us, but we had to buy both. Her price was $10,000.00 and the other party was willing to pay it. So after finding this out, a member of our city offered to loan us the money to purchase the engines. 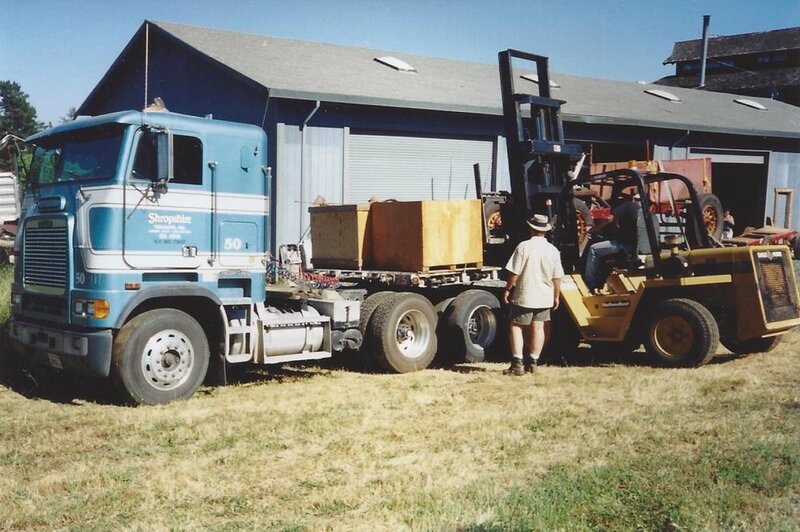 A local business owner donated the diesel truck it took to get the two frames and boxes of parts home. We formed our group as part of the Lindsay Cultural Arts council and with the name “Restore the Fire Truck Committee,” and spent the next 12 years raising money to repay the purchase price, and buying or fabricating parts. During our research on the two engines we discovered that both fire engines have history in Lindsay, They are consecutive registration numbers from American La France, Reg #541 and Reg #542. Reg #541 went to Fresno after the Expo, then to Woodside in 1918, and then to Lindsay in 1933, where it was in service until 1960. After it was retired, it went to the Tulare county museum where it was left outside and fell into disrepair. 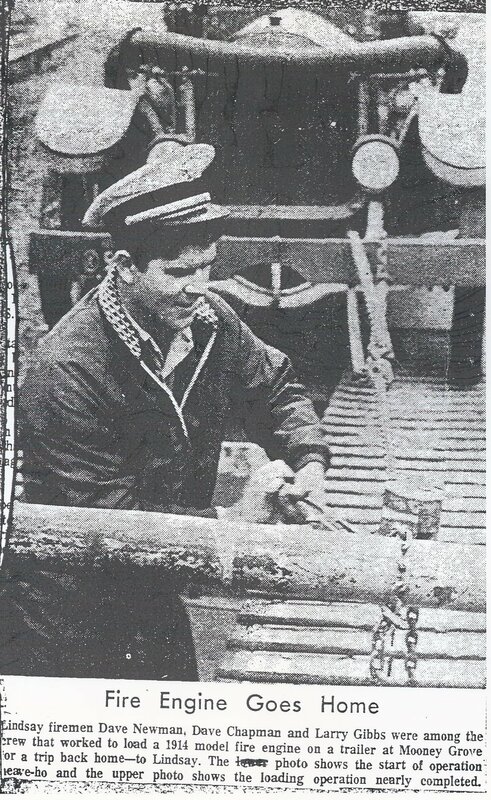 In 1967 a group of volunteer firemen brought it back and spent three years getting it back in running condition. This is where it stayed until the 1980s when it went to Fresno. Reg #542 was owned by Don Jones in Porterville. 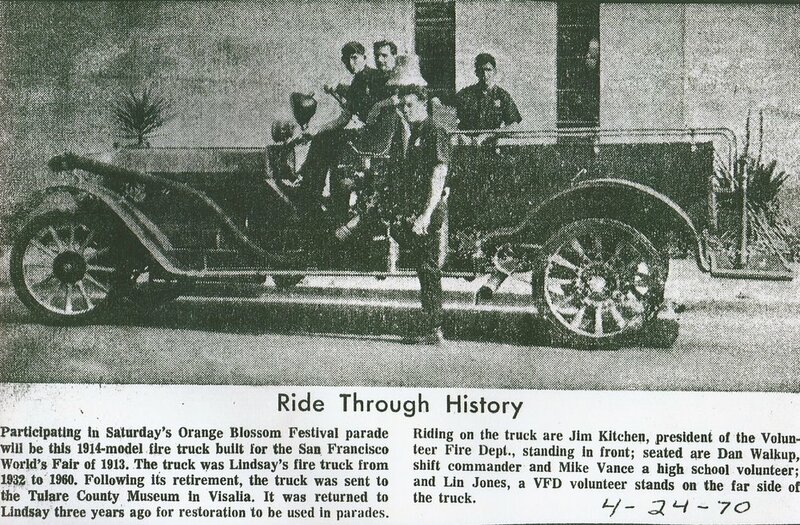 The Elks Club Dixieland Jazz Band rode on the fire engine in local parades, including our Orange Blossom parade, from the 1950s until 1974, when the engine was sold to the Morro Bay Fire Department. They also disassembled the fire engine to restore, and never put it back together. 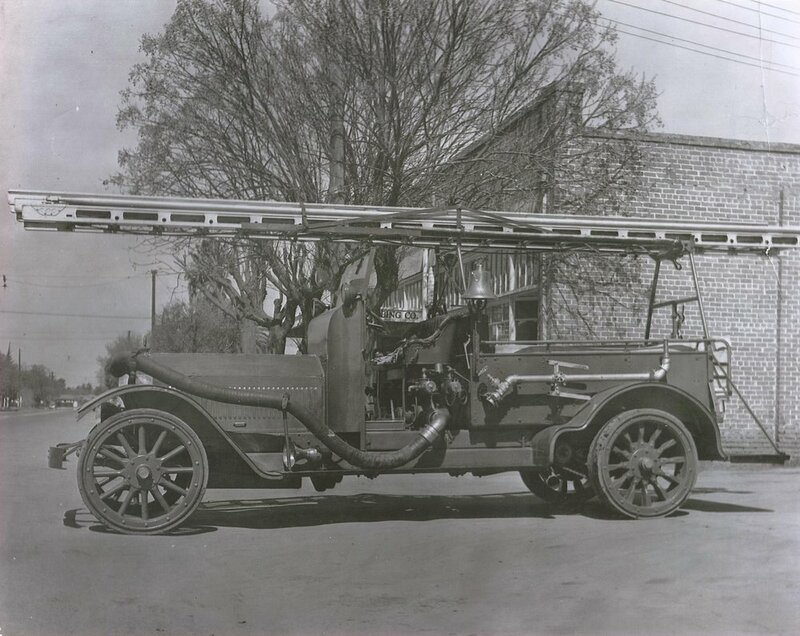 They traded the 1914 to the collector in Auburn for a restoration of a 1940 Federal fire engine. 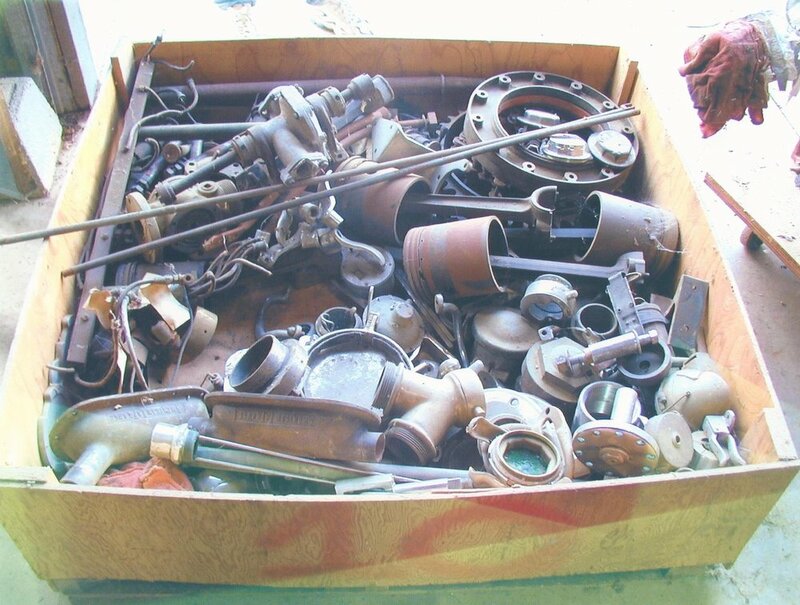 This is the engine we chose to restore first. It was completed in time to be the centerpiece of the centennial of the opening day of the Pan-Pacific Expo held in the Palace of Fine Arts. By 2010 we had collected other fire engines and equipment, so we opened the Lindsay Fire Museum next to our original fire station and around the corner from our current station. 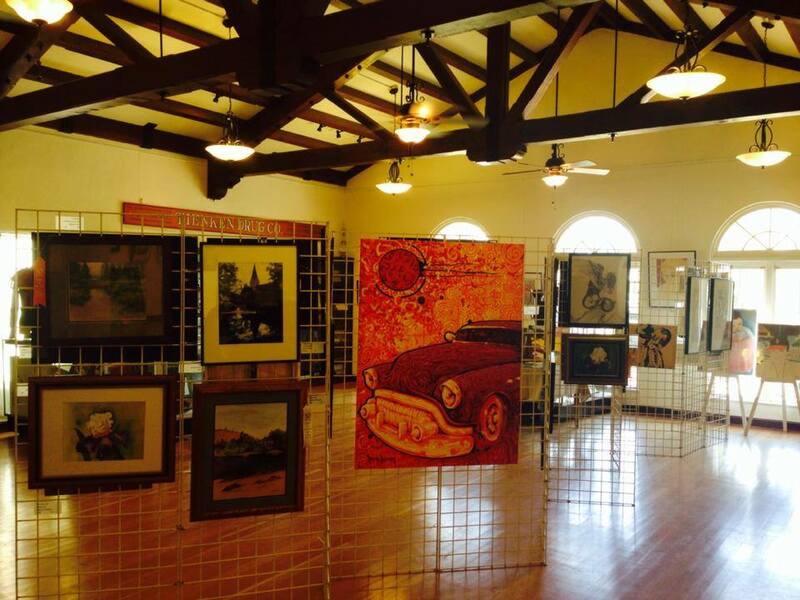 Through exhibits, programs and lectures we endeavor to showcase, preserve and share Lindsay’s unique history. In the museum’s brief, three year existence we have created exhibits that provide visitors with a glimpse into not only local history, but how it intersects with our state and national history. An early 20th century medical collection, including items from a 1906 apothecary, and Lindsay’s first physician, Dr. Annie Bond. Dr. 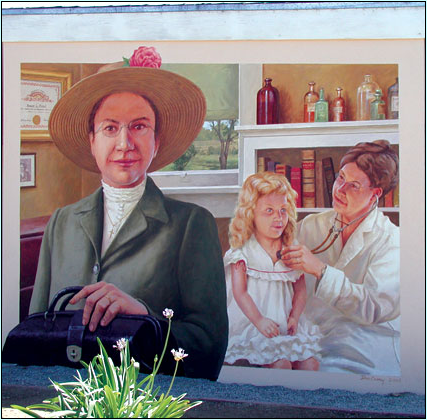 Bond was a pioneering figure for women in medicine and for the introduction and early use of vaccines. Both collections provide a fascinating look at the world of healthcare during a time, not too long ago, before germ theory and science were applied, and folklore and superstition reigned. Lindsay’s early agriculture industries and the innovations and culture that emerged to support it. Lindsay served as the heart of central California’s citrus boom, thanks to its immigrant founder and his wife, for whom the town is named. Lindsay inspired innovations in irrigation and inventions like the first steam powered harvester, olive pitting machine, and wind machines as well as the long running Orange Blossom Festival. 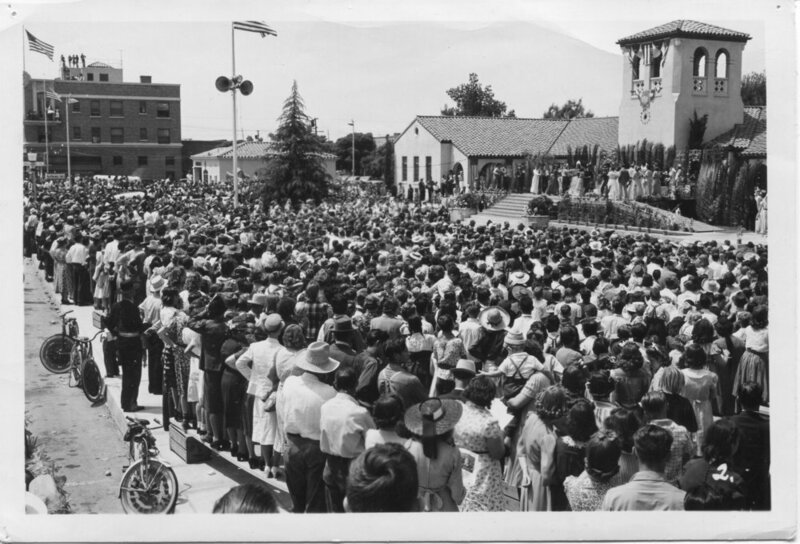 The festival, which originated in 1932 to promote the local citrus industry, once attracted up to 40,000 attendees, and is a tradition that continues to this day. Go For Broke! Pre-WWII, a significant portion of Lindsay’s population was of Japanese ancestry and even featured a Japantown to serve the community, made up of restaurants, shops, hotels and even a school – that was until Lindsay citizens were forcibly removed and placed in concentration camps following the issue of Executive Order 9066. Our collection features a collection of WWII war trophies, tools, photographs, and various items bought back by veterans of the famed 442nd Regimental Combat Team, made up exclusively of persons of Japanese ancestry. To this day they remain the most decorated regiment in United States military history. Si, Se Puede! United Farmworker’s Union and the movement lead by civil rights heroes Cesar Chavez and Delores Huerta that affected many local families. Exploring the expanding roles women played both on the homefront and in military service, focusing on the stories of Lindsay residents. 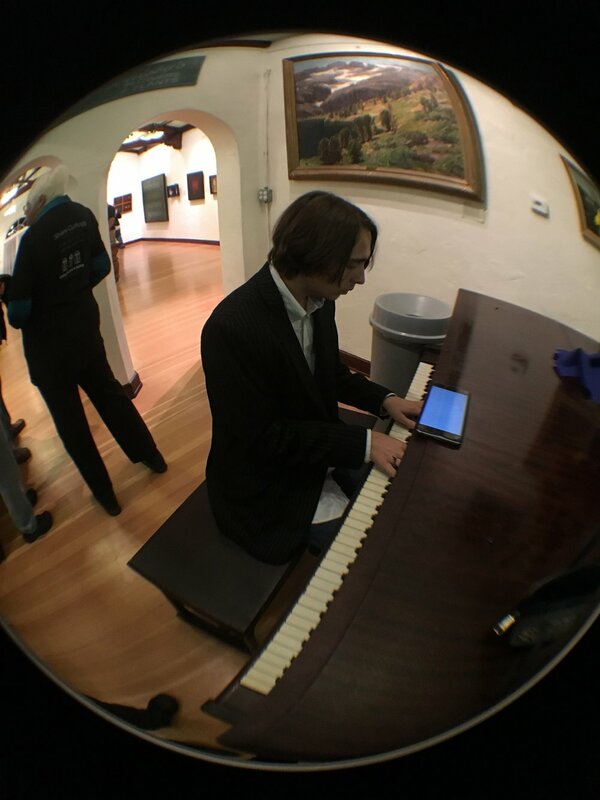 The Hammond Collection exhibit will debut in March of 2018. We have hosted a variety of historical illustrated lectures, created free, educational programming for local schools, serving approximately 400 students each school year, created a small research library, provided lectures and presentations to community service organizations, and have sponsored the creation of the very first book honoring Lindsay’s fascinating early history, Lindsay: Images of America authored by our curator. The museum is host to hundreds of local schoolchildren each year. We have created programming to serve them and supporting teachers, focusing on the California and Lindsay pioneering experience with an emphasis on what it was like to be a child during this time.